You’ve heard the old line, “Death doesn’t take a holiday.” While it is true, Death can certainly take your holiday. When the dark scythe casts a long shadow over a loved one’s soul around a time of celebration, whether Christmas, Thanksgiving, or even a birthday or anniversary, that special time is forever imbued with a twist of sadness. We lost my husband’s uncle this week, not altogether unexpected, but sooner than thought. Some in our family will not be ready for Christmas, and old St. Nicholas will be unable to make things jolly. It will be a bleak midwinter day. And yet death is a time of togetherness, the bonding over someone loved, the tidings of comfort if not joy. Our uncle will be there with us, a part of our hearts and our memories, and so he lives on. We may be sad that his physical presence is gone from us, but we can still speak to his memory, hold his hand in his remaining possessions, and see him in photographs. His spirit can remain alive within us. And so, any time, and especially on each anniversary of the day he left for heaven, we can bring forth memories of him – the peanut brittle he loved to make, that fruit cake he ordered each Christmas, the rows of pecan trees he planted, the bright yellow Cub Cadet he splurged on (oh, my goodness, it wasn’t a John Deere! 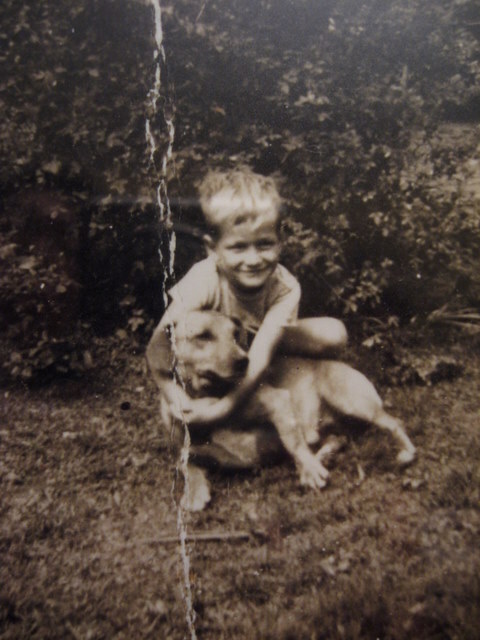 ), an old photo of a little boy and his dog – to celebrate his life and remind us of the good times we shared with him. Christmas will come, and he will have a place at our tables. We can raise a glass in his honor, to toast his life and what he meant to us. I think he’ll see us, and know how much we love him. Merry Christmas, Uncle Harold, and may peace be with you – and us. This entry was posted in death, holiday, memories. Bookmark the permalink.